Dieses edle und kunstvoll gefertigte Schwert ist ca. 86 cm lang und kommt mit einer schoenen Wandhalterung aus Holz. 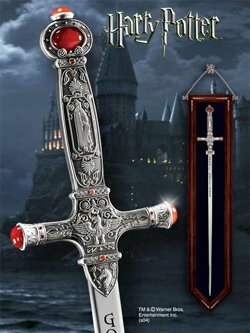 An authentic recreation of Godric Gryffindor´s sword, as seen in the movie Harry Potter and the Chamber of Secrets.The intricately detailed handle is set with crystal cabochons. Sword measures 34 inches in length and comes permanently affixed to a beautiful wood display plaque.